Two pitches. Climb obvious gully on LHS of buttress. Short multi pitch route on the nice buttress just right of Number One Gully. There are two routes on this attractive pyramid this is the left hand of the two climbs. both are a similar grade. Left of SMS. Up a rock step left of triangle prow. 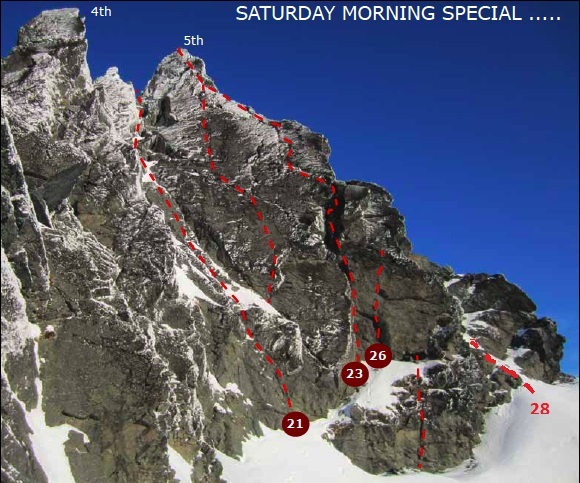 Head on up gully for 5m then move left on ledge below fist rock step, continue up angling left (limited gear), finishing under big roof and break in arete. Small steeps and snow gullies a great introductory route to climbing on the West Face of the Telecom Tower. Tony Burnell, Sally Ford, Aaron Ford 2009. Just Right of SMS. Bouldery move over chock stone. Sally Ford, Tony Burnell, Micheal K 2012. 1 short pitch leading up to the ledge that Recessionary Downgrade and Blow Up start from. Ben Dare, Danny Murphy 2010. A short pitch right of Ben Dover. Somewhere between M4-5. The crack is step but short and the difficulties will be over quickly. A good test piece M5. Originally graded M7 by the first party to try this line who attempted to traverse in from Blow Up. Climbed during the height of the GFC where the prices of many things were falling. Just like the GFC the grade of this route took a tumble. Walk up sloping ledge towards the obvious steep crack of Blow Up. Start in the left-hand corner. Pitch two heads towards an obvious off-width crack. Place your biggest cam high in this crack then down climb 2m and out 2m onto the black slab. Climb this direct for 5m until you reach another crack. Start breathing again and continue upwards. Quite sustained for the grade. Continue to top and walk off. Up very steep hand crack on great holds with excellent gear. Double bolt belay with 30m rap to the ground. An excellent route which is much steeper than it looks. 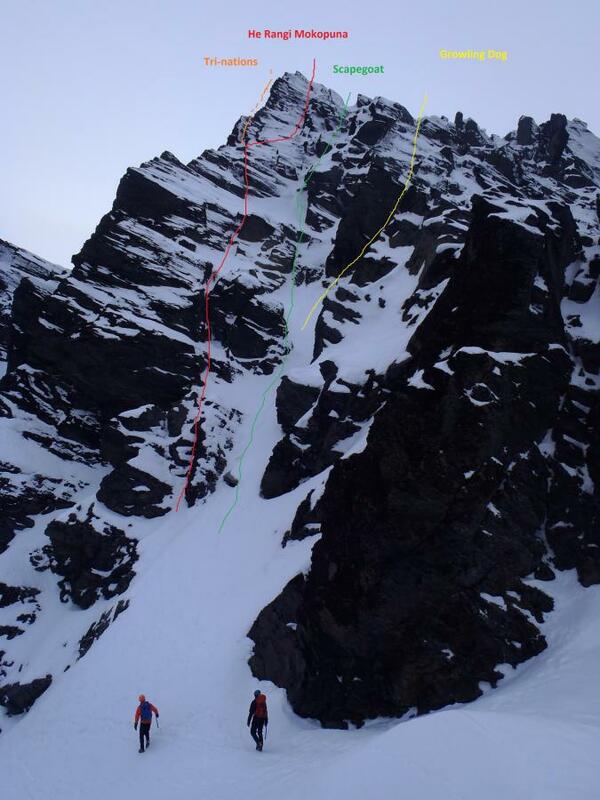 FFA: Daniel Joll, Cris Vanyo, 2011.
just to the right of Recessionary Downgrade; ascends ‘a series of corners’ on the right hand side of a ‘prominent [arête] before reaching the crest and following it for the final pitch;’ Three pitches. 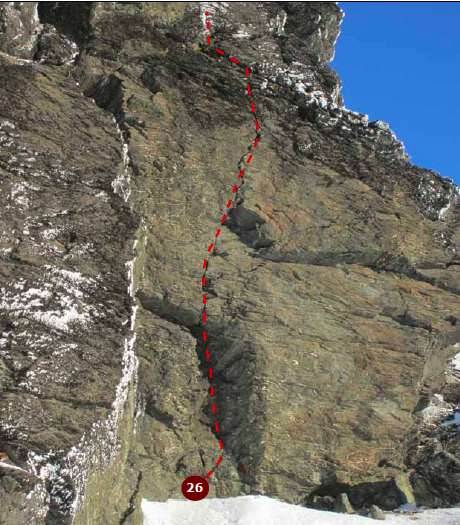 Start up easy gully, where it narrows, step left onto slab with small right facing corner. Finish up steep blocky ground, or out right (easier). Start up Gully of Scapegoat and move right under roof crack. Dave Bolger, Greg Larkin, 2009. Material from "REMARKABLES ICE & MIXED FESTIVAL ICE & MIXED GUIDE," 2012. Well, Saturday Morning Special has the wrong route number assigned to it otherwise it is marked in entirely wrong. I climbed the route a week ago and it was just 110m long. Tried to fix this up. There are a few errors around on the topo, feel free to edit and clean them up.